Learn about the 7 tax myths you need to be aware of this year. 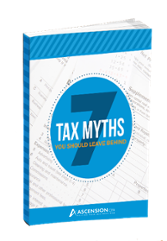 Our free e-book "7 Tax Myths You Should Leave Behind" will help you make filing this year's taxes even easier by providing true & false statements on deductions , credits, retirement & more. Just as our great nation is always growing and changing, so are the laws, specifically when it comes to taxes. Are you aware of what you should do and what you shouldn't when it comes to your taxes? It is my hope that these 7 Tax Myths You Should Leave Behind make you a savvier citizen.